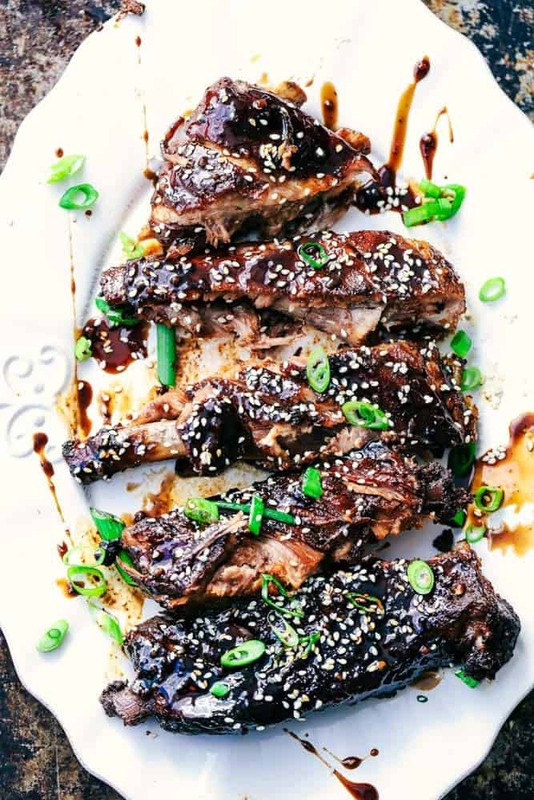 Slow Cooker Sticky Asian Ribs with Sticky Sauce are the very best fall of the bone tender ribs you will ever make! Slow cooked to perfection in a sweet and tangy asian sauce. They get slathered right before serving in a finger licking good sticky sauce! I can hardly contain my excitement over here you guys. 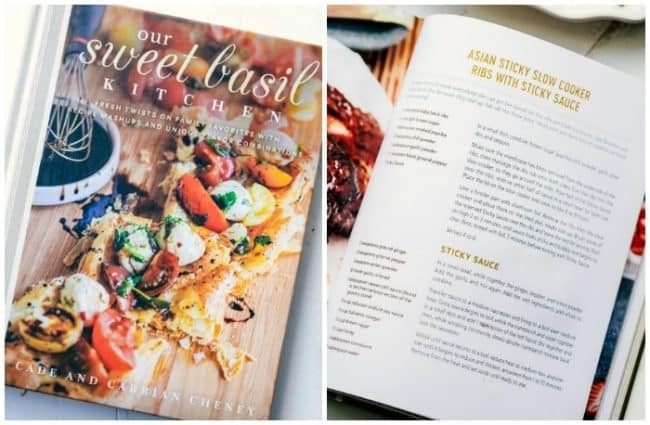 My cute friend Carrian, at Oh Sweet Basil just released her new cookbook, Our Sweet Basil Kitchen, and it blowing my mind. It took me so long just to choose a recipe out of it because they are all so delicious! Every single recipe is one that my family would love. We have already made her famous Teriyaki Chicken Casserole and I am pretty sure that I have every page dog eared for our family to try. This is a cookbook you will use for your family again and again! It was so hard deciding what to make. 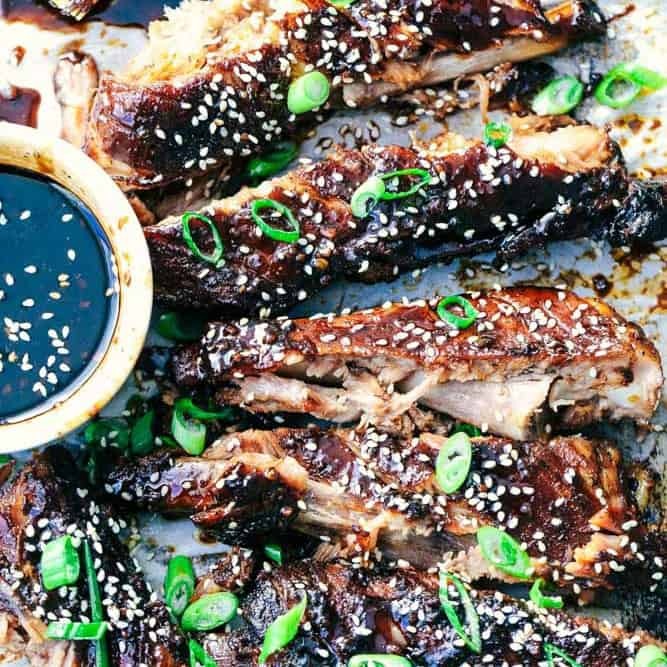 I was able to narrow it down to to these Asian Sticky Slow Cooker ribs. 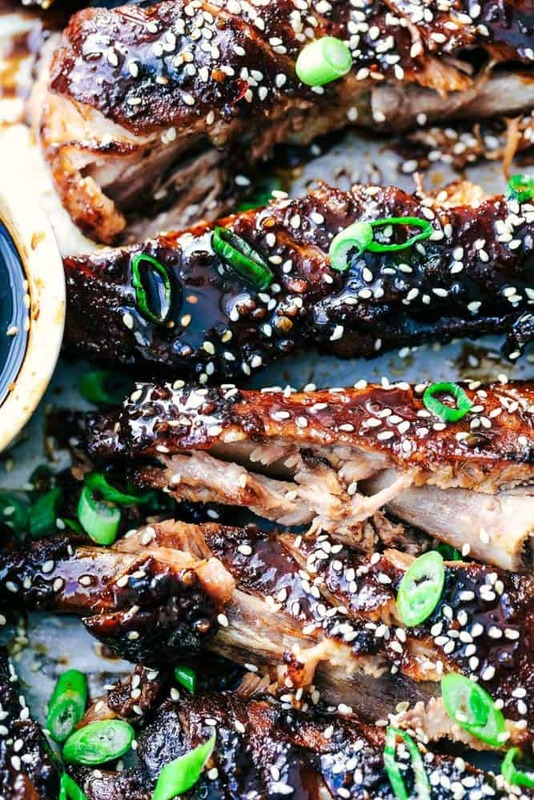 Simply because I prefer my ribs cooked in a slow cooker AND our family loves asian flavors. 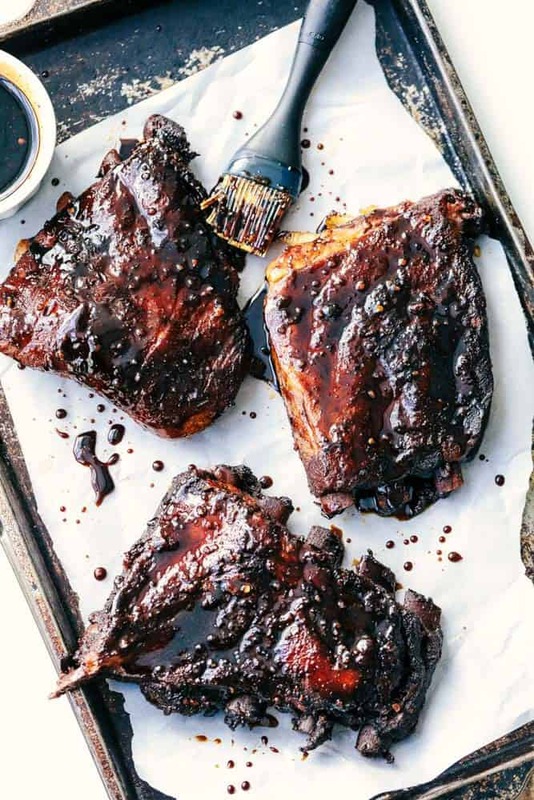 If you haven’t made ribs in your slow cooker yet, you need to drop what you are doing and make this recipe for dinner tonight!! The meat literally falls off the bone because it is so tender. 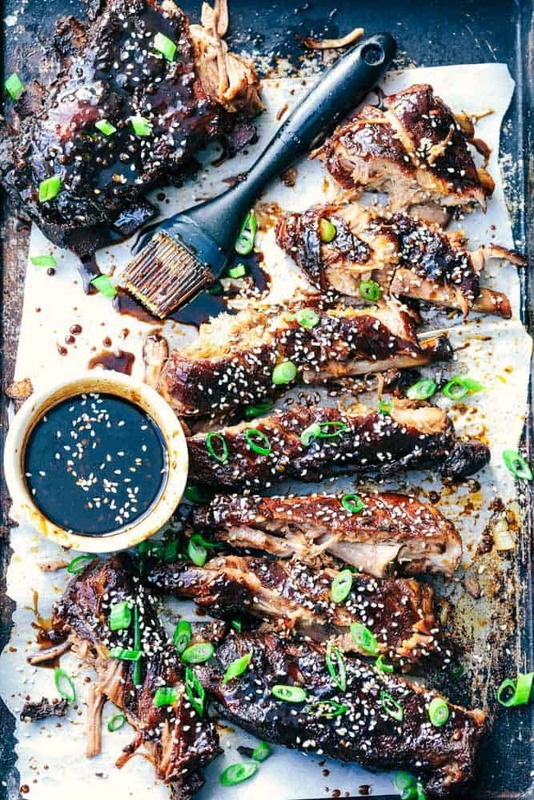 You start out by creating the most amazing spice rub for these ribs. A little bit of sweet and heat goes into this spice rub and coats the ribs perfectly. You put them in the slow cooker and let it do its magical work on these ribs. 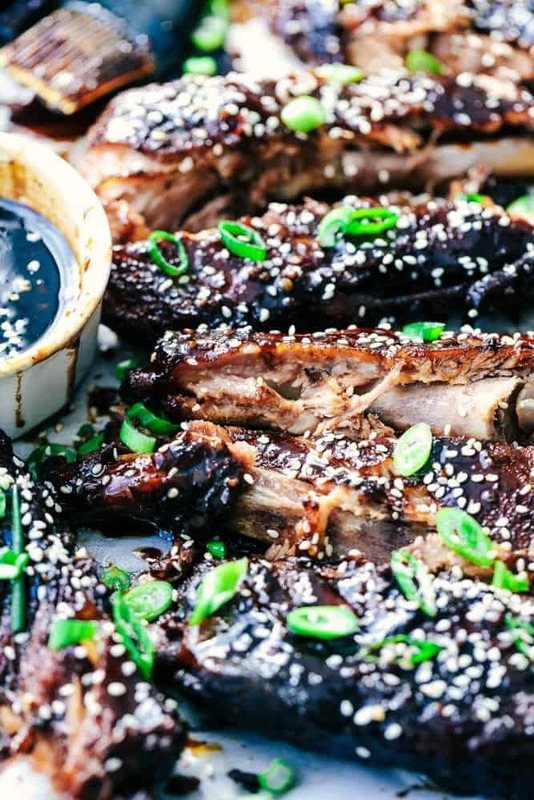 Once these ribs slow cook all day long in a sweet and tangy asian sauce, you remove them broil in the oven for a few minutes. This is totally an optional step but in my opinion a MUST. This gives the ribs a nice crisp edge and makes the sauce nice and crispy on the top. But the sticky sauce. Holy cow. Carrian sure knew what she was doing when she made this recipe because it was the most amazing finishing touch. It is all about the sticky asian sauce at the end. It is a mix of sweet chili sauce, soy sauce, balsamic vinegar, brown sugar, honey… all of my favorite ingredients. You thicken it up and slather it on the ribs right before serving. My youngest son is a rib LOVER. He is the pickiest eater but when it comes to ribs and wings he can’t get enough. I knew he would be so excited for these ribs. He said these were the best ribs that he has ever had in his entire life…. (of 9 years ?) and ate half of them! I would have to agree with him. These are the best ribs that I have ever had in my entire life. I can’t emphasize how badly they need to be made at your house. And don’t forget to get a copy of the Our Sweet Basil Kitchen Cookbook. You will love all of the recipes inside just like we did! To make the sticky sauce: In a medium sized dish, whisk together the ginger, pepper, and onion powder. Add the garlic and mix again to incorporate. Add sweet chili sauce, soy sauce, vinegar, brown sugar and honey. Whisk until incorporated. Mix the dry rub ingredients together in a small bowl. Remove the membrane and place the ribs into the slow cooker. You can either curl the ribs along the slow cooker or cut them into sections and place on top of each other. Massage the dry rub into the ribs on both sides. Pour half of the sticky sauce mixture into the slow cooker and reserve the rest later for the sticky sauce. Cook the ribs for 6-8 hours on low heat until the meat is tender. Remove the ribs from the slow cooker and place them on a foil lines broil pan with the meaty side up. Brush some sauce from the slow cooker on top of the ribs and broil until the edges start to look crisp and broiled. Allow tented with foil to rest while you make the sticky sauce. To make the sticky sauce: In a medium saucepan over medium high heat, add the reserved sticky sauce to the pan. In a small bowl combine the cornstarch and water plus 1 Tablespoon of the hot liquid. Pour into the sauce pan with the sticky sauce whisk until the mixtures starts to thicken. Remove from heat and brush on top of the ribs. Serve immediately. I’d like to make these for my husband and sons. What sides would you recommend serving with this? I’m making these tomorrow. Planning to serve with white rice and roasted broccoli. These look amazing!!!! I love asian flavors so much and haven’t done ribs with an inspired sauce before. I’ll have to try this! didn’t realize until your photographs that ribs are exactly what I’m in the mood for, haven’t made them in awhile for no apparent reason, so thank you for giving me a reason! I love the recipe critic recipes. I have made several recipes and they are always amazing. The best alfredo sauce ever, truly is the best. Making the sticky ribs today, I’m sure they will be to. Thank you for sharing! I made these this weekend and I haven’ t been able to stop thinking about them. Thank you for the great recipe. Thank you so much for sharing. Only found this recipe two months ago. About to make it for the second time. My 18 y/o says I finally learned to cool. More like, that goodness for slow cooker. Best gift ever. 10/10 would recommend! This sauce is so good that it made my eyeballs roll back in my head….seriously good! I served with jasmine rice and Panko/Parmesan crusted cauliflower, but steamed broccoli would be good too! This rub was so good! Tastes like BBQ chips! I’m going to use it often! Omg. Best ribs ever. Would recommend to everyone.